Open loop power control together with optional power ramp-up is used during the random access process at the beginning of the connection until more accurate control information is available. Power loss due to transmission distance depends on to the increase of the distance between NodeB and the UE. In such a case, feedback information from another side is not necessary for estimating power loss. This type of power loss is controlled by the open loop power control. RACH (Random Access Channel) uses open loop power control. 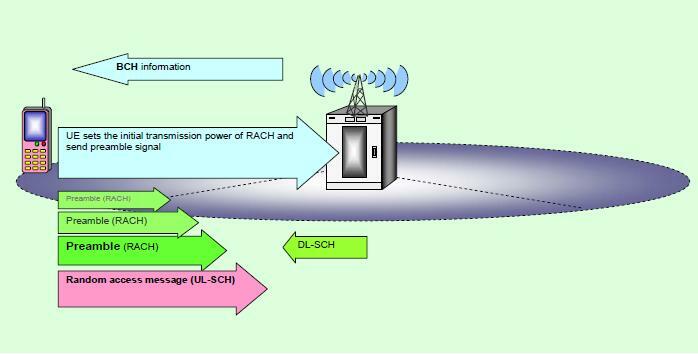 The Open Loop Power Control is performed by the UE, after receiving information transmitted on system information block in broadcast channel (BCH) and measured the path loss in the downlink. The NodeB broadcasts the initial transmission power level and the power step to the UE in the BCH (Broadcast channel). The UE sets the initial transmission power in the first preamble and waits for the UL grant on PDCCH. If not acknowledged, the MS increases the preamble transmission power by a specified power offset step. 26 queries in 0.323 seconds.